About Us - Basement Technologies of WNY Inc. Basement Technologies of WNY Inc.
Are you in need of experienced service for your cracked basement walls? 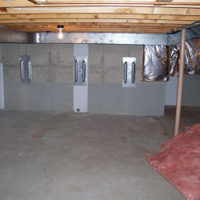 Would you like basement waterproofing for your Buffalo, NY home? Do you want foundation repair but you aren’t sure where to turn to? Basement Technologies of Western NY, Inc. is exactly what you need. Call us today at (585)-869-9623 and we will happily help you with your basement repair needs. At Basement Technologies of Western NY, our commitment to our customers is to provide the highest level of services. Basement Technologies of Western NY is a family owned and operated business, proudly serving Rochester, NY; Buffalo, NY; and the surrounding community. We truly believe that our customers deserve only the best, and that is why we are driven to achieve perfection on every job. Our owner and President, Patrick McDonald, has an extensive background in both residential and commercial construction, and personally oversees the progress of every job site. Here at Basement Technologies of Western NY, we believe that our customers are paying for our expertise both on and off the job. We take ownership of each project from conception through completion to ensure that we give you the highest quality results and the best customer satisfaction possible. True Basement Technologies of Western NY is licensed, bonded, and insured. We work with you through every step of the repair process.